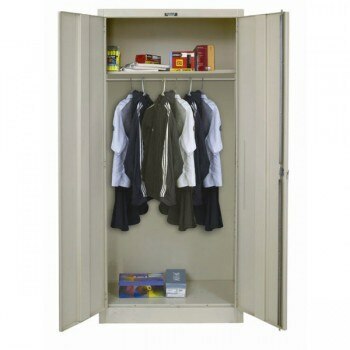 This cabinet model is ideal as a wardrobe in stores, factory locker rooms, offices, etc. It allows convenient hanging of coats, uniforms, jackets, etc., and keeps them protected from stains, theft, etc. Units include 1 fixed top shelf that allows better use of the height of the cabinet and a rod for hanging garments on hangers. All-welded door frame assembly assures even closure all the way around. Doors are factory assembled in their frames to provide an accurate fit. They include full height door stiffener and swing 180º. No bolt heads are shown in front or side panels. Finish. Professional looking, durable 20 gauge steel sheet components. All metal parts are precision engineered. Corner Foot gussets provide added rigidity and stability. Positive 3-point lock (top, center, and bottom) and theft resistant hinges for added security. Designed to meet government requirements. Assembled wardrobe cabinets are also available. Special shipping applies.